In 2007, at the very young age of 21, I was prescribed the toxic antibiotic known as Levaquin. I was just graduating college to work with people with mental and physical disabilities, little did I know that levaquin would soon leave me permanently disabled. My adult life was just beginning when Levaquin took my health, and more importantly much of my future. Not all side effects are short term…especially not with the toxicity caused by this class of drugs. Levaquin affected almost every part of my body. Here is a short list of the symptoms I have had to endure as a result of this toxicity, and continue to suffer with on a daily basis to this day. The list goes on and on.…Levaquin has affected my life in every single possible way. I could write a book on all that I have gone through and all that I have lost, but I’ll spare everyone the sad details and share with you what I really want to emphasize. The damage and loss I have experienced as a result of taking this drug was NOT worth the risk of taking it. 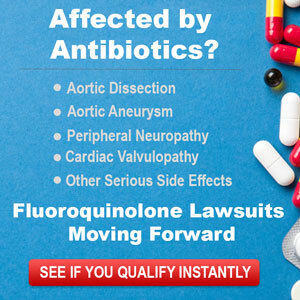 Nor was I ever informed of the risks associated with Fluoroquinolone Antibiotics. I write this in hopes it will help educate others, and to use these drugs as a last resort when safer antibiotics can be prescribed for minor infections. I now try to devote what little energy I do have to helping spread awareness and to help manage The Fluoroquinolone Toxicity Group on Facebook for victims of Fluoroquinolone Toxicity and their loved ones. I still suffer daily with a laundry list of symptoms, and although I try to keep the faith that maybe someday they will slowly disappear, I know there’s a high likely hood that I will be stuck with these “side effects.” On a positive note I have learned a tremendous amount of things and gained a wealth of knowledge that I wouldn’t have had this not happened. I have also met some of the kindest and most caring people who are also victims of FQ Toxicity, and I have developed some wonderful friendships for which I am so very grateful. I’m so sorry for your pain. How long was the course of medication that was prescribed by your doc, and how long did it take before you started feeling symptoms? I’m thinking that maybe people can be alerted to some of the side effects early on and stop taking it. Did you have any vague feeling like “weird” at some point that might help others identify early warning signs for others to quit. Or was this a delayed effect? Thank you, Vera. My reaction was pretty immediate (began while on the course of antibiotics.) But with this class of antibiotics the effects can show up weeks, months after discontinuing the drug as some things did… My first sign was extreme night sweats and feeling like my central nervous system was “wired” and I became very shaky, could not even hold a glass of water in my hand. My best advice is to trust your body in hopes that it will give you warning signs…but as I said unfortunately with this class of antibiotics symptoms can pop up after stopping it..which makes it tricky and often times hard for people to connect the pieces of the puzzle. There must be something that can be done in terms of regulations or restrictions, perhaps such as an allergy alert, or trial doses before you take the first dose, which is usually a double one to start. Also if you need an antibiotic, perhaps if one has any suspicions, one should ask the doctor for the old trusted ones first before the more broad-spectrum ones, which cause more side effects and bad reactions. They still work very well. I believe your best and probably only recourse at this stage is to try to rebuild your body with vitamins and supplements. Regardless of what they tell you, you cant really overdo most vitamins, except perhaps vitamin A, but you can usually take double or triple of most without much consequence. 4-6 times the recommended dose of any vitamin is really not too much. Each person has to gauge themselves to see the effects. In 7 yrs not one symptoms improved at all? Like not even the anxiety/depression/high heart rate? Bill, unfortunately no. I m definitely a severe case, some do go on to heal. I still have hope that with good nutrition and a positive outlook that maybe my body will heal, at least to some extent. Kelly – My heart breaks for you… and for myself. Like you, my entire body was affected, and I have seen no healing. I hope to hear back from you. I hope in the two years that have passed since your post that something has improved. So sorry to find this. My 13 year old daughter has almost all the same symptoms and after 1 1/2 years, there is no improvement. At times, things are worse. There was tremendous improvement after 6 or 7 months but then everything got worse. I was hoping , like others, to see that some things have gotten better for you for your sake but also to offer some hope to me for my daughter. Can you update us? I am completely heartbroken to hear that your daughter is suffering like this, Lauren. I hope that she improves. I’m so sorry for both her, and your, pain.